If you recall, part 1 was a flannel blanket; part 3 was adorable baby shoes. Now get real with me mommies… Have you ever found a really nice store-bought, manufactured burp cloth? I never have. Sure, folks use folded up blankets or towels or pre-fold cloth diapers… but the secret to having nice burp clothes is to find someone who sews and get them to make one of these easy projects. 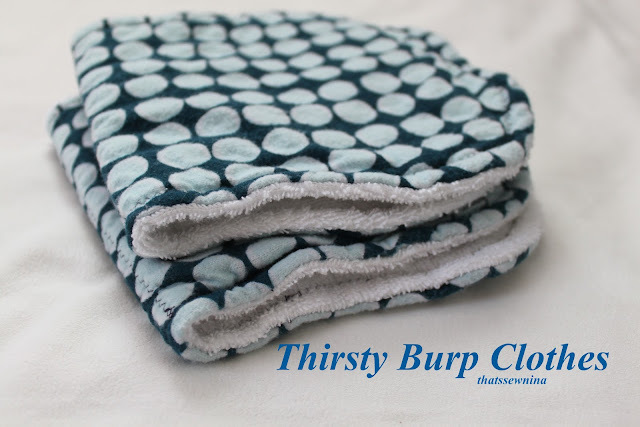 For each burp cloth, cut one piece of flannel, one piece of terry cloth and one piece of batting. There’s no need to be crazy meticulous here. I think it’s fine to stack the fabrics and whack them with a rotary cutter if you have one. You can also trace the pattern with a marking pen and cut them out with scissors. Copy my pattern onto a 8.5x11 sheet of paper and either cut from the fold or, like I did, trace the full pattern onto a paper bag or whatever. I have two different versions* cut from the same materials. I’ll show the more traditional version first. I’ll also say you don’t HAVE to include a batting layer. Most tutorials of this type of burp cloth just use two layers of flannel…but let me tell you, it’s worth it. They’re softer, prettier and WAY more absorbent than just two layers of flannel. Stack your fabrics: terry cloth, flannel (with the right side facing down), batting. Okay, if you’re the meticulous sort, you should probably stop and pin your fabrics together here. I am not a pinner (at least… not that kind of pinner.) So I just stack and sew and do my best to keep my fabrics lined up as I go. I use a standard ¼” seam (the edge of your presser foot) for pretty much everything. Be sure to leave a small gap (2-3”) along one of the long sides so that you can turn your fabric right sides out. Now, I am a backstitcher. Whenever I begin a seam where I will be leaving a gap, backstitch a few stitches when you begin and do the same when you approach your gap. Trim the excess fabric around your seam down to 1/8” of an inch or so, being careful not to cut into your seam. When you reach your gap, leave a bit more of the fabric so you have enough to neatly fold in when you sew your finishing seam. Stick your fingers in through the gap and turn your fabrics right sides out. If you stacked your fabric correctly, your batting should be in the middle with your flannel and terry cloth visible from the outside. Use the end of some stick-like object (the eraser side of a pencil, the end of your scissors, whatever you have hand), to gently push at your seam from the inside to make sure your seams are totally turned out. 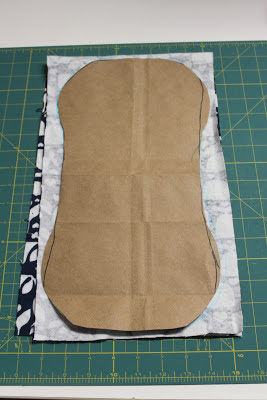 Iron your fabric with a hot, hot iron to flatten it and prepare it for your finishing seam. Neatly tuck in and press the fabric at your gap so that it fits in with the rest of your seam. 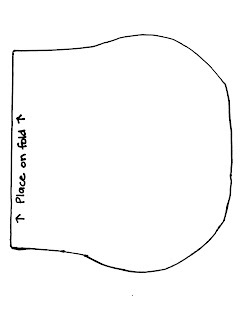 Starting near your gap, sew a border about a ½” from your edge all the way around. You can use a cute zig zag or decorative stitch here. I also like to fold my burp cloth in half hamburger style and mark the fold with a marking pen and sew a seam right through the middle. It looks nice and just makes the burp cloth fold a little nicer. Trim your excess threads and you’re done! This may be a little less traditional for an edge but I like it because it creates a fluffy look and a softer edge. I love the look and feel of rag-time quilts so tried it on a burp cloth and loved it! Fold the flannel and terry cloth back and use scissors to carefully trim the batting right down to the seam. You will want to keep the excess flannel and terry cloth. See in the first picture the batting sticking out on the right. On the right side picture, the batting has been trimmed away. Using your scissors, carefully cut into the excess terry cloth and flannel every quarter inch or so. 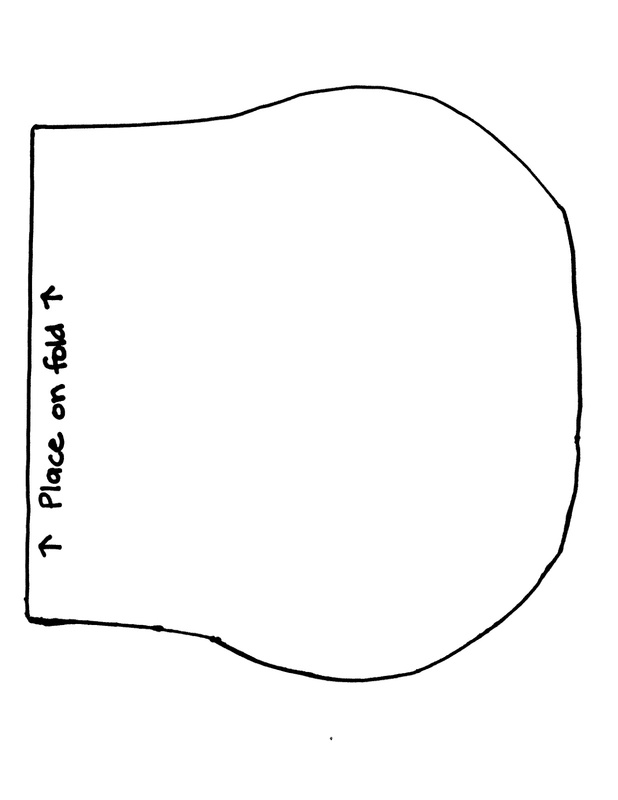 Go all the way around your project being careful not to cut into the seam. Wash and dry your burp clothes once or twice to allow the fabric to fray to get that softer edge. The first picture is the fringed burp cloth unwashed. The second picture shows the difference after one washing. You may need to trim your terry cloth a little after washing because it frays differently than the flannel. I am trying the frayed edge idea on some cloth wipes for my daughter! What a great tutorial, and so easy! I am a little obsessed with making these now. Thank you! !